The reboot of the original Planet of the Apes franchise, began in 2011 with Rupert Wyatt’s Rise of the Planet of the Apes. The advances in motion capture technology, not to mention the emergence of Andy Serkis, who had been honing his skills for the role of Caesar in such films as The Lord of the Rings and King Kong, was bound to eclipse the original film and its many spin-offs. ‘Rise’ was a flawed, but impressive prequel to the 1968 classic starring Charlton Heston. With its focus on the cruel treatment of animals in captivity, not to mention the search for a cure for Alzheimer’s, it was less mindless than most summer blockbusters but not as tense, taut, witty or well-written as the allegorical 1968 original. 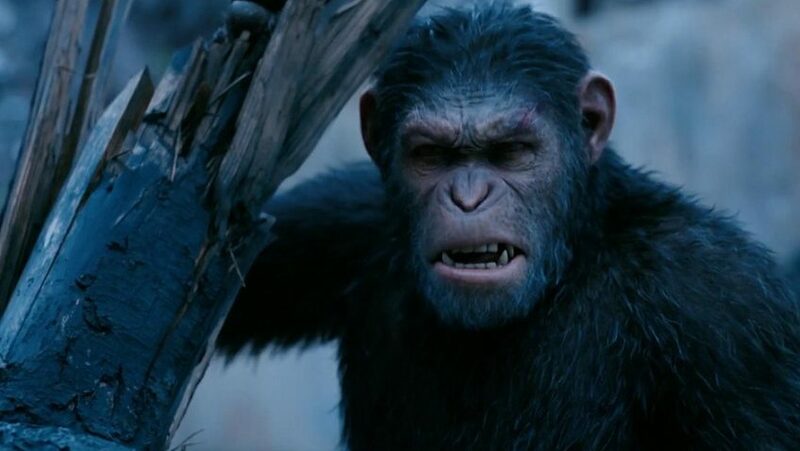 Then Matt Reeves took over and in 2014 we had the thunderous, unforgettable Dawn of the Planet of the Apes with script writer Mark Bomback brought (work with the character-creators, and ‘Rise’ script writers, Rick Jaffa and Amanda Silver) and a powerful score from Academy Award winning (Up!) composer Michael Giacchino. Reeves also brought in then 71-year-old Michael Seresin who is proof, if proof were needed, that age is only a state of mind. In War for the for the Planet of the Apes, which we’ll call ‘War’, Giacchino once again creates a powerful, distinctive and epic score, while Seresin’s cinematography does the business, encompassing motion picture capture, live action, and fast paced action scenes with horses, apes, and humans in enormous set pieces with hundreds of ‘extras’, real and computerized. Using a large-format, ultra-hi-def camera Seresin and Reeves take such pains with each frame that they make framing-obsessed Director Joe Wright look careless. The setting is the Muir Woods ape colony near San Francisco ten years after the pandemic of the deadly Simian Flu virus saw the population of the planet reduced to near extinction level. Those humans who survived proved to be genetically immune to the virus. Apes, on the other hand, benefitted from the same virus with genetically enhanced intelligence. 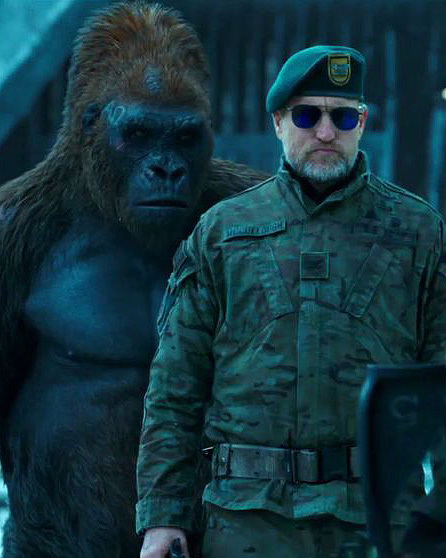 At the end of Dawn of the Planet of the Apes they started to build a civilization of their own with the English speaking, hero of ‘Dawn’, Caesar (Andy Serkis) as their leader. The fair-minded, peace-seeking Chimpanzee Caesar knows that the humans will never forgive the aggressive actions of rogue ape Koba, a scarred Bonobo, whose hatred of humans stemmed from his inhumane treatment at their hands. In ‘War’, Caesar, who has always condemned revenge, compromises his principles with disastrous results. Reeves has so many close-ups of the continually pained and conflicted Caesar that you wonder if he is admiring the special effects works, or going for a Best Actor Academy Award for Andy Serkis. The opening scene is a fierce battle with heavy losses on both sides. The humans attack with guns and destroy a settlement with male, female and child casualties. A band of apes retaliate with archers on horseback forcing the humans to retreat. Caesar’s army has captured several humans who expect to be killed, but Caesar sends them back to their camp on horseback in an appeal for peace. Peace does not come, however, and Caesar arranges for the ape population under his command to migrate to a safer area. 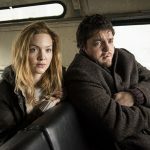 Caesar, who has learnt that his wife (Judy Greer) and one of his children have been killed, admits that he is not above revenge, and vows to destroy the person responsible. In this manner, over two hours of war is commuted to two bookended war scenes. In the middle is Caesar’s familiar revenge story, which takes the form of a standard road movie. Naturally, as in your typical Western, which War increasingly resembles, he cannot travel alone or there would be no one to admire his coolness, heroism and self-sacrifice. He is accompanied by Chimpanzee Rocket (Terry Notary), his close adviser, the orang-utan Maurice (Karin Konoval) and the courageous, thoughtful gorilla Luca (Michael Adamthwaite). On their journey they come across a settlement that has been mysteriously abandoned save for a man – who picks up a gun and his shot in self-defence – and a mute girl, Nova (Amiah Miller) who might be his daughter. The blond haired, blue eye beauty could not look more human, but she may be mutating into an ape, with the loss of speech rendering her lower on the animal scale, than the ape. She bonds with her saviours instantly. This is a nice, ironic touch, for, as we learn, the son of the sadistic leader of one human army, The Colonel (Woody Harrelson), fell victim to this side-effect of the flu, reigniting the Colonel’s hatred for the apes and fueling his design revenge. The motley band on the road, which now includes Nova, discover a traumatized zoo escapee who calls himself “Bad Ape” and speaks excellent English. Steve Zahn plays him for laughs and you will welcome the comic relief in this exceptionally bleak tale. But this character, more than any of the others, feels like an ingredient in a recipe for a block buster. And, not surprisingly, this cowardly, small-sized chimp, who dresses in human fur-lined winter coats, proves to be a real hero. Bomback and Reeve’s slick, detailed script might lack originality, but it is determined to be relevant, even at the expense of subtlety. Aimed squarely at Donald Trump, the wall building President whose son hunts elephants and tigers for sport, the dystopian story makes humans the enemy as they refuse to share the planet with other species (read also ethnic types, nations etc). There is even a scene in which The sadistic, The Colonel, who has imprisoned the apes in a replica concentration camp pending their extermination, forces them to build a wall. The wall is used to keep out, not animals, but another army of humans due to invade from the North (the South would be too much, even for Reeves). If this is not enough, the American Civil Rights movement is brought in when the apes behind barbed wire raise their arms and make fists to signal their solidarity with Caesar, strung up to a wooden structure reminiscent of a – you guessed it – cross. 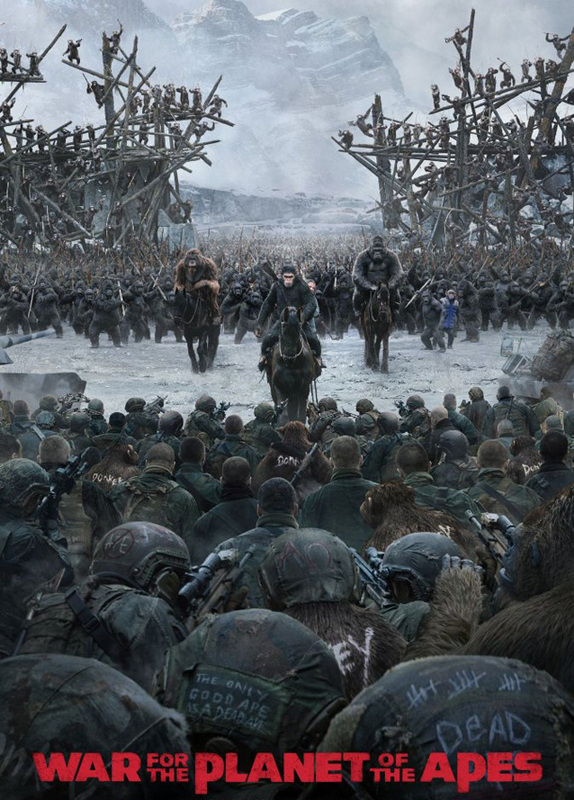 The problem with War for the Planet of the Apes is that the apes are so humanized and their actions and capabilities mimic those of American human heroes to such an extent, there is really little difference between this movie and all the others to which it pays homage. We think of The Outlaw Josey Wales, Bridge Over the River Kwai, the Great Escape, the Empire Strikes Back and even the most recent human vs. animal film, Okja, with its climax in a slaughter house. Reeves and Bomback made a conscious effort to work in all the tropes of these successful buddy/road/revenge/ escape films and you feel it. What we are left with is a visually flawless spectacle that tries so hard to have heart that it leaves you cold.